Class Page - How to take a class by E-mail and set-up a log-in. NOTE: These classes are available to Royal Highlands Residents ONLy at this time. If you live nearby (in the general area), please contact me to discuss taking this class. Contact Di Binder by email: (dbinder2004@comcast.net). Your e-mail address (the primary e-mail address that you will use for class). This is important as this is how you will be accepted to log-in the website. Your name, complete mailing address, phone number where you can be reached. Your level of Computer Knowledge between 1 and 5, with 5 being the best. How do you wish to pay for this class? (Choices: Check or Cash). Classes available at this time are: (1.) Basic E-mail Techniques, # 101; (2.) Basic Facebook Techniques, # 102; (3.) Basic Internet Techniques, # 103; (4.) Basic Apple Ipad Techniques, (based on the model you have). Each class will cost $20 per person (Royal Highlands Residents ONLY at this time). Windows 10 and a new Operating System, as of August, 2015 - Free to download until July 29th. Windows 8.1: Ready to update and ok. Be sure to keep updating as you are notified by Windows Updates. New Apple IPhone 6: Suggestion...Wait for a while to purchase, until the dust settles. Seems ok to purchase now. Be sure you hold both the 6 and 6 plus to see the difference in sizes. Apple IOS 8, 8.1, 8.2 - Update - Suggestion...Do not be in a hurry to update. There are always issues with a new update. You are much better off to wait for a while, until the dust settles. Also, if you have more than one Apple device - ie: iphone and ipad - you need to update both for them to sync correctly. Apple Devices: Check out our Apple SIG. The majority of attendees have Ipads, but, we would like to address other Apple devices, as well. Join us. Hardware is best described as a device that is physically connected to your computer or something that can be physically touched. Most hardware will contain a circuit board, ICs, and other electronics. A perfect example of hardware is a computer monitor, which is an output device that lets you see what you're doing on the computer. Without any hardware, your computer would not exist, and software would not be able to run. Reply ALL: Never reply all unless you have the permission of all recipents. This is very irritating to those who receive it. Additionally, it is not the proper way to use email. It is also a matter of privacy. Many email users will delete, block or hide your emails - if you persist in "Reply All." 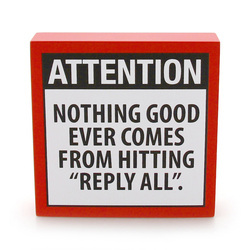 As, the sign says (to the left), ATTENTION..."Nothing Good ever comes from HItting Reply All". 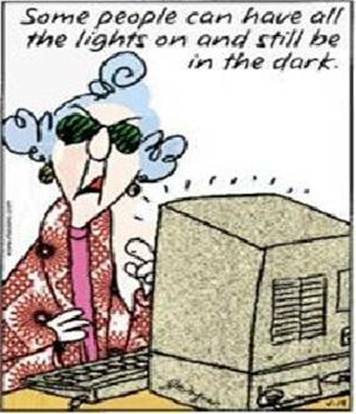 Hey Maxine...be patient - that is why we are working on an education page, so you won't be in the dark. You will be "enlightened." Operating System - The "brain" of the computer or device. The operating system communicates between the hardware and software. Examples of Windows OS would be - Windows 10 , 8, 7, Vista, XP, 98, 95, DOS. IOS: The operating system of Apple devices. For example - IOS 9, 8, 7, 6 for iPads & iPhones; started out as System 1 and most recently - OS X El Capitan, and previous years were: Yosemite, Maverick, Mountain Lion, (just to name a few). Ipad vs Tablets - An Ipad is made by Apple and uses the IOS operating system. Tablets are made by a variety of different manufactures, (ie: Samsung, Sony, Amazon, HP, Dell, Microsoft, etc). Their operating system is Windows and/or Android. The most often mistake made by consumer...."I have an Ipad." And, it turns out to be a tablet. Remember, and Ipad is an Ipad, and not known by any other name. Windows 10 - The new Operating System (OS), as of 10/2015. Java, is a programming language used through a﻿ browser, ﻿which enables the browser to perform a function or feature not normally available. Maximize, ﻿When you maximize a window on your computer screen, it becomes larger. In Windows, maximizing a window makes it take up the entire screen. In Mac OS X, a maximized window typically only takes up as much space as it needs. Malware - Short for "malicious software," malware refers to software programs designed to damage or do other unwanted actions on a computer system. In Spanish, "mal" is a prefix that means "bad," making the term "badware," which is a good way to remember it (even if you're not Spanish). Common examples of malware include viruses, worms, trojan horses, and spyware. Browser - ﻿A software program that allows a person to explore the Internet in an easy to use way. Navigating the Internet through a series of hyperlinks you can browse the Internet. Examples of popular browsers are Chrome, Internet Explorer, Firefox, Safari, and Opera. The XP Operating System is retired. 2. Click the Start button to find your programs. 3. If your computer freezes up, click the keys...Ctrl, Alt, Delete...to open task manager and quit programs. 4. The current operating system is Windows 8. There will be NO Windows 9. Windows 10, 2015. 5. You can find all your files in Windows Explorer or now called, File Explorer in Windows 8. 6. IE means Internet Explorer. 7. www stands for the World Wide Web. 8. When you turn your computer on, the Screen with the icons is called the Desktop. 9. A shortcut for printing a document is ctrl + P.
10. The left mouse button is the action button.